What is a study plan without execution? It’s like having a cure and deciding not to take it. But you can have a CFA study plan that works – and that can cure your persistent CFA exam pain – lack of MOTIVATION! Read on to find out all about it. So, you have your CFA study plan. All you need to do now is to stay committed to your new study schedule. With motivation – however – the story’s rather tricky. Your motivation is high after you register for your exam and shortly before you take it. No wonder it’s hard to notice when things start to go bad and you start dropping out (actually, the odds are you’ll notice that a bit too late...). This is why you need constant encouragement. To keep your motivation strong. Internal motivation is what you can find inside yourself. Just think about why you registered for your CFA exam in the first place. Surely because you saw it as something relevant to you. Because becoming a CFA charterholder means growth to you as a professional and is an important milestone in your career path. Passing your CFA exam is your Great Goal with a big G. It would be perfect if you kept it in front of your eyes all the time while getting ready for your exam. Thus, constantly enhancing your internal motivation to help you get going with your preparation day by day. However, internal motivation is extremely difficult to maintain. It’s more natural for those with the self-desire to seek out new challenges, gain knowledge, become their better selves. All in the name of growth for the growth’s sake (so: perfect for those we named the Growers last time). But if your internal motivation is too weak, you can also rely on the external motivation. It will trigger your drive to success by making your goal more attractive and worth achieving. One of such outer stimuli is bigger salary as you reach this important milestone in your career path and get promoted thanks to passing your CFA exam. However, this money motivation is quite distant and – once again – can be insufficient to keep you motivated on an ongoing basis. Does it mean then there’s no reliable way to stay continually motivated over the days, weeks, and months of your CFA exam prep? Of course, there’s a way! You need to seek external incentives with the power to repeatedly trigger your motivation. 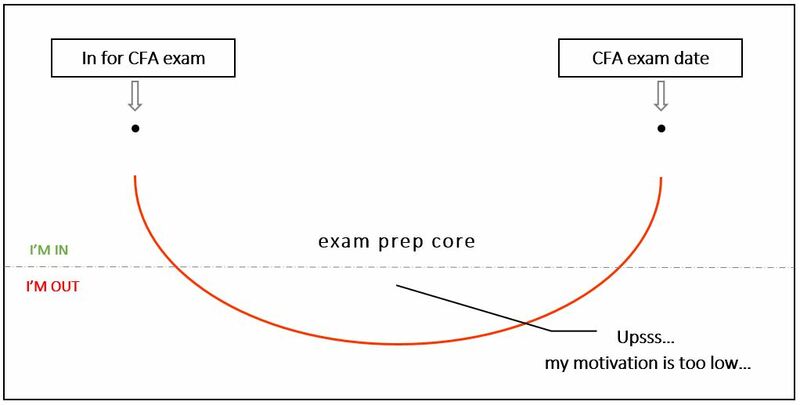 Here and now as you prepare for your CFA exam. Because to achieve your Great Goal, you need to stay motivated not just for some time after you register for the exam and before you actually take it. You need to stay motivated every week of your preparation. Not to drop out but to stay in the game. And to execute what you’ve planned! The metaphor of a game is not accidental here. To accomplish your Great Goal and pass your CFA exam – you’ll want to achieve a sum of small goals. Just like with a game – to win, you need to score a number of points that totals up to your victory. These small goals that enable you to achieve your Great Goal are your weekly CFA reading assignments – all scheduled in your personalized study plan the way you need it. For doing these readings – you score, which obviously increases your chance to succeed (unless your rival – :De-motivation – scores more...). Yep. To play a winning game here, you need to employ your Motivation and make it work for you non-stop on 2 layers: of long enough and good enough preparation. Just like sports champions spend long quality training hours before they win, you need to spend long quality study hours before you pass your exam. But what does it mean long quality study hours? How many hours is long enough? And what quality is good enough? It is repeated like a sacred mantra that you need approximately 300 study hours to get prepared for each level of your CFA exam. This overall number doesn’t tell you though how much you should be studying per day, week, and month to get yourself well prepared. And this detailed knowledge is something that would benefit you much more than the sacred 300 hours. That is why – in your new CFA study plan – you’ll find estimated current week time which tells you how much time approximately you should spend doing the CFA readings scheduled for your current study week (each reading is also given its time!). For those of you who like challenges, this estimated weekly value may be motivating in itself by inviting you to take up the study time challenge. But for those who are motivated when they see achievement – estimated current week time is divided into done & not done. 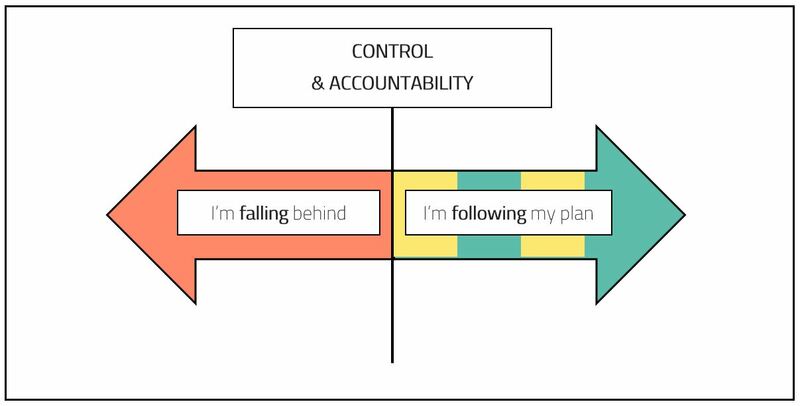 The former grows as the latter falls every time you do your CFA reading completely or partially (and change this reading’s status to done or partially done in your study plan ). How long exactly you need to study weekly for your CFA exam depends on several factors: some technical ones (e.g. how many weeks there are until the exam) and some individual ones (e.g. how much you already know in the topic). So, in fact, this estimated current week time is meant as a benchmark for you – to give you the accountability but also the flexibility you need. And, above all, to give you the encouragement to keep on executing your study plan despite difficulties. Your estimated current week time is the total sum of your current week readings’ times. To be executed, a good study plan requires data. And calculation. There is no calculation-free planning as such. Using the study time estimations given inside your study schedule, you can calculate how well you’re doing over the week. You can also adjust your execution accordingly, especially if you’re not doing that well... And while there’s nothing wrong with one poor study week (it can happen to anyone), there’s a problem if it becomes a rule. That is why, a measure that shows your progress from week to week is built into your CFA study plan. It’s called Chance To Pass because obviously if you execute your study plan in the long run – your chance to pass your CFA exam increases, and if you don’t – it simply falls. In the way it works, the Chance To Pass measure has its motivational aspect. 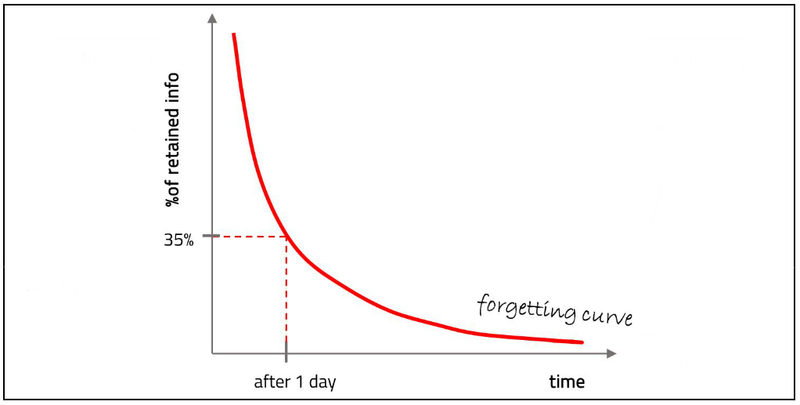 By growing – it rewards those who are consistent in their study plan execution, and by falling – it rightly punishes for inconsistency and procrastination. You can see your Chance To Pass after each study week when you sum up your weekly tasks on every Sunday. Systematic summary of your study weeks is something that always affects your Chance To Pass positively because it shows your commitment and determination – the qualities you need to develop for successful study plan execution. But Chance To Pass also gives you a wider than weekly perspective – by tracking your progress from week to week, it shows you in advance if you’re headed for a good month study-wise, or not. And gives you the opportunity to react just in time, not to drop out again! Because you need to keep up your good work over all the months of your exam prep, not just the first 2 weeks or so. Your Chance To Pass is a detailed measure that reveals your progress and attitude. 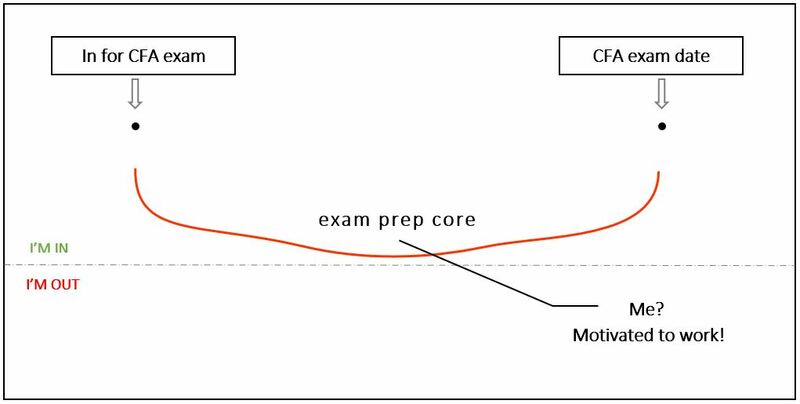 Unbelievable how much motivation and information about your study plan execution you can get simply by observing your estimated current week time and Chance To Pass. But I bet you’re asking one thing now: What do I do exactly to carry on with my CFA readings and see my estimated current week time go down day by day and my Chance To Pass go up week by week? Good study planning requires not only data. It also requires tactics. You need to plan what to study, when to study, where to study, and how to study to study best. Otherwise said, you need to develop your study routine. One that fits in your weekly agenda and responds to your study needs. what study strategy to apply for effective learning. These messages help you develop a good study routine. And with a good study routine – you get the effective means to execute your study plan . Successful study routine is a combination of 2 factors: high motivation & good performance. In fact, all the motivation incentives that come together with your new CFA study plan are motivation-oriented and performance-related. Not only the messaging. Well, we thought it would be such a pity to waste all this increased motivation just because you didn’t know what to aim at to truly benefit from it. Now, with the flexi-time benchmark, detailed progress measure and study tips that help to build your study routine = you know how to execute + you stay motivated all throughout your CFA exam preparation period . You know what else is motivating for all students, whatever exam they study for? Talking about growth. Because talking about growth makes us aim higher and do better – no matter if we’re more of a Fixer or more of a Grower. In other words, it makes no difference if with your fixed mindset you care more for achievement or with your growth mindset you choose the challenge. Talking about growth always makes you improve. I would like to motivate you to be your better self and to learn how to learn to optimize your study time and study results. To get to know how to outdo yourself and get the best prep ever – one that maximizes learning and minimizes forgetting – read my next post. Because the ultimate goal for your study time is to have quality.